This pen was designed and created specifically for Office Max, so they are only available at their stores or website. Since I don't have an Office Max nearby, I never had the opportunity to pick any up, and it looks like I was missing out - that is until a wonderful reader sent me a couple to try out (Thanks Marilyn!). The pen design is solid, with a plastic barrel and a brass tip, as well as sharp looking graphics. 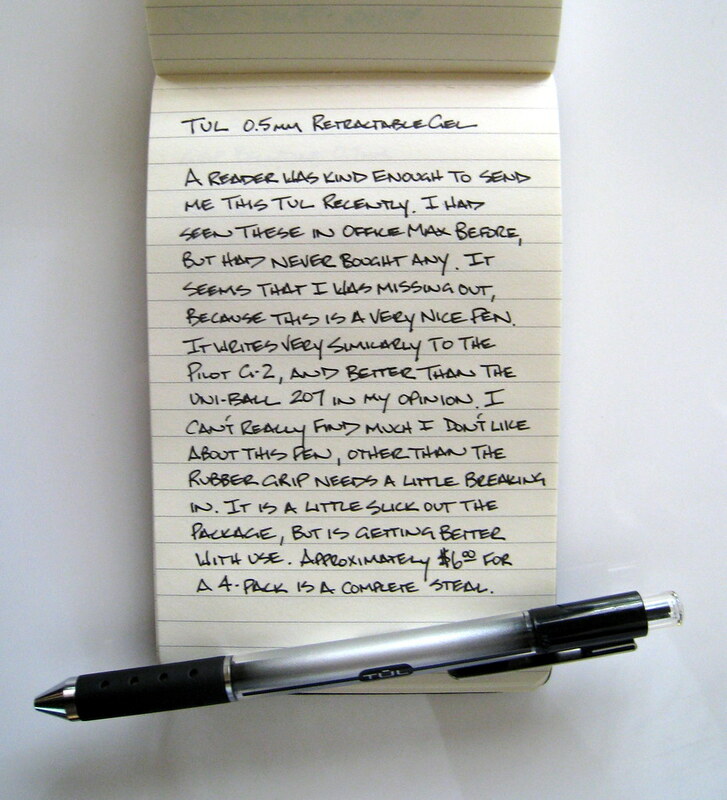 The pen performance reminds me a lot of the Pilot G-2, which is a pretty big compliment. On top of that, the TUL is very wallet friendly, checking in at approximately $1.50 per pen. My only complaint so far is that the grip is a little slick, but it is already starting to get better with use. If you have an Office Max convenient to you, or feel like placing an order online, I think you will enjoy the TUL. Posted on August 21, 2008 by Brad Dowdy.